Once we get into November, the Christmas decorations go up all around London, and the Christmas Markets come out onto the city’s streets. Unlike the usual markets selling vintage goods, food, or clothing, obviously, these are geared more towards the festive season. While some take on the normal look of market stalls, others look like little cottages decked out in lights and greenery. Still, others are parts of winter holiday festivals and can include rides and games. If you find yourself in London from November to December, be sure to check out one of these five Christmas Markets and let us know what some of your favorites are in the comments. Found by the Thames, London Bridge City sets up a series of stalls that add to the beauty and charm of this space within view of Tower Bridge. Like most Christmas markets, it offers an array of Christmas and holiday-themed merchandise, food, and drink from Turkish the Lights to Christmas Puddings. Local bands and artists also make up the market, so it can be a good place to wander for a beautiful view of the Thames and shop some Christmas items without having to go to one of the winter fairs. Speaking of winter fairs, Winterville is one of the larger winter fairs in London and worth spending some time during the holiday months. Held last year in Clapham Common, Winterville features an array of carnival rides and games as well as stalls featuring a number of local and independent crafts and goods. There are also plenty of bands, performances, film screenings, and other activities to capture your attention while you shop. Leicester Square is a fun place year-round whether you’re visiting one of the cinemas, catching a glimpse of a star at a film premiere, or taking in one of the nearby shops. However, the square becomes something completely different when the holidays come around as it transforms into its own Christmas market village. Perhaps it’s the setting that makes this one of the more glitzy Christmas markets in the city and musical acts performing here have included Adele. You certainly won’t want to miss the visual spectacle and be sure to visit Santa in his Christmas Grotto if you’ve got the kids along. Certainly the largest Christmas fair in the city, Winter Wonderland takes up a big chunk of Hyde Park every year and fills it with lights, rides, games, street food, drinks, and of course—Christmas markets. The market stalls at Winter Wonderland are almost exclusively dedicated to the holidays featuring an array of Christmas candies, unique crafts, and holiday decorations to fill your home. What’s more, you can guarantee that Hyde Park has the biggest Farris wheel of any of the city’s winter carnivals as well as an open-air ice rink for skating. Make sure you get some of the attraction tickets in advance, or you could be waiting a while for the ice palace. 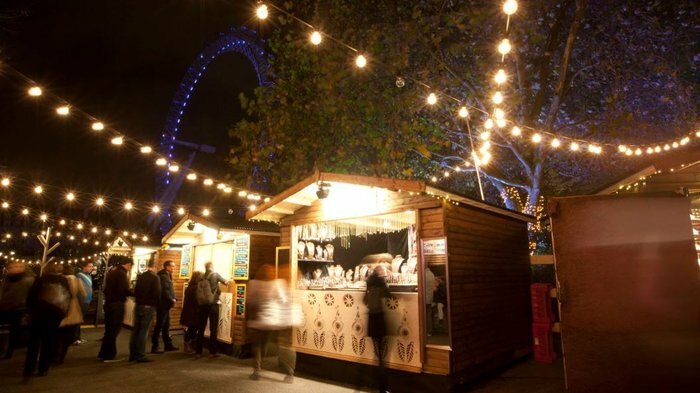 Southbank Centre gets into the Christmas spirit with their Nordic-themed village every year sporting plenty of shops and cafes. The theme means that in addition to such goodies as mince pies, you can also enjoy German sausages or Swedish treats to have with your hot chocolate or spiced plum cider. The shops themselves are filled with a variety of items whether traditional or more bespoke pieces. Whatever reason you come for, Wintertime Market certainly feels like one of the most immersive experiences that London’s Christmas Markets have to offer.